The ruthless and brutality been meted on innocent Nigerians by the men of the Special Anti-Robbery Squad, SARS has come to fore again as a viral video has shown that some operatives of SARS, Rivers State Police Command indeed brutalized a mechanic identified Lucky Joseph. The incident according to Punch occurred in the Choba Extension, Obio Akpor Local Government Area of the state. He added that he was not aware of the torture. 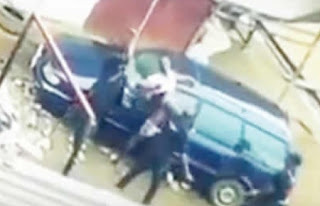 But the video, which had been trending since Thurday, showed three policemen beating up the 38-year-old. In the video, while one slammed him repeatedly with a cutlass, another was seen opening a tear gas canister in his face, while the third held him down. The victim’s trousers were pulled down, exposing his private parts. The assault went on until two men intervened towards the end of the one minute video. The resident who posted the video on the Internet said the policemen collected N30,000 bribe before releasing Joseph. He said, “So, I was going to act like this never happened 10 minutes ago. But my inner man won’t let it slide. Some men of the SARS pulled up my street around the University of Port Harcourt and carried out their normal pocket search. After harassing the boys on my street, they picked Lucky (Joseph), who is well known by all. I guess they didn’t find anything on him but a phone. Guess what they asked for, the receipt. Who carries that around? He laughed and the reply to his laughter was a slap. The victim, however, said the torture had nothing to do with a phone receipt, adding that the policemen beat him up after he refused to enter their operational vehicle. He said, “My boss had paid my salary into my brother’s account because I couldn’t access my account number. I decided to buy a new phone to avoid this in the future. I went to a bank to withdraw some money and was returning when the policemen held me. “They said they wanted to search me and I told them to hold on and allow me to search myself because the SARS men in our area have the habit of planting all kinds of exhibits on people. After they searched me, they found my handkerchief. They wanted to return it when I asked them to hold on. It was while we struggled that three hemps fell from their pockets. He said some residents later intervened and begged the policemen, who took N30,000 before releasing him. Joseph told PUNCH Metro on Monday in Pidgin English that he had yet to recover from the torture, saying he had been going to a hospital for treatment. While seeking redress for the assault and protection from victimisation, he said he could recognise the three policemen who beat him up. “They were led by ThankGod, who lives in my area. I have been incapacitated and I have spent N27,000 on hospital bills. Please don’t let me suffer in vain,” he added. When contacted, the Force Public Relations Officer, Moshood Jimoh, promised to call back our correspondent, but had yet to do so as of press time. Also, the Head, Police Complaint Rapid Response Unit, Abayomi Shogunle, could not be reached for comment on the incident.